The veteran and legendary British filmmaker talks exclusively to DMovies about 2,300 Daniel Blakes, a government that deliberately murders people, nostalgic period dramas, Britishness, Brexit, immigration and whether Cathy would be homeless 50 years later! This 80-year-old English director from the small town of Nuneaton is the most recognisable face of British working-class realism, with a career spanning more than five decades, and more than 60 films for both cinema and television. He also counts two Palme d’Or awards under his belt: The Wind that Shakes the Barley in 2006 and I, Daniel Blake this year, plus a number of accolades from every corner of Europe and the world. I, Daniel Blake saw its theatrical release just 11 days ago, and it has since stirred a lot of controversy. The rivetting drama tells the story of the eponymous 59-old widower and carpenter living in Newcastle (played by Dave Johns). 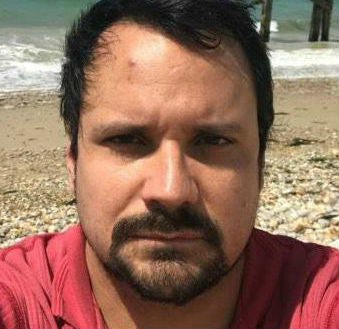 Daniel has had a heart attack and his GP and physiotherapist will not allow him to go back to work. Tragically, he gets caught up in the red tape of the callous benefit system. The outcome isn’t rosy, with the stress of the procedure triggering a fatal heart. Victor Fraga, editor at DMovies, met up with Ken at the offices of his film production company Sixteen Films for an exclusive interview . We asked him dirty questions about his though-provoking feature, his left-wing political allegiances, Cannes, Brexit, Truffaut, George Lloyd, Cathy and Daniel. The well-mannered cricket-lover has views that are both accurate and sobering. So read on! DMovies – Two thousand and three hundred people in the UK died between December 2011 and February 2014 after they were deemed fit to work, according to figures published by the DWP in August 2015. That’s 2,300 Daniel Blakes. Where did we get it so wrong? Ken Loach – Well, I don’t think we got it wrong. This is a deliberate policy of government to drive people out of the benefit system. They know what they are doing; they know that they are humiliating and destroying people by how they operate, by forcing sick people to go through an assessment in order to get the means to survive. And in that situation of course people will die. That’s unfortunate collateral damage for the government. DM – Our reader Richard Banker said in a Facebook comment of our review of I, Daniel Blake: “The whole system was brought in by New Labour in 2008 with the Employment Support Regulations 2008 and awarding Atos Origin the contract. It has taken the Labour Party till now with the advent of Jeremy Corbyn to finally repudiate the system. I will be watching it”. Do you agree with Richard? KL – I absolutely agree. The Labour Party under Blair and Brown was, in some ways, hardly distinguishable from the Tories, and they did bring this system in. The Party now under Jeremy Corbyn is a different Party, politically. The Shadow Minister of Housing said that Labour would end the assessments and rely instead on doctors and consultants, the real medical experts to provide the answers, and they would also end the punitive sanctions regime. These sanctions drive people’s lives into chaos. There’s nothing in their fridge, nothing in their bank account. They have nothing. They become hungry, and they can’t get warm. The government uses hunger as a weapon to discipline people. Your reader is dead right. That was Labour indeed. Thank God that Labour Party no longer exists, except for the few idiot backbenchers who attack Corbyn all the time. The Labour Party under Jeremy Corbyn and John McDonnell is very different. DM – The Welfare State is now over 100 years old. Do you think the former Chancellor of Exchequer and Prime Minister David Lloyd George would be proud of what has been achieved in a century? KL – I wouldn’t say the Welfare State began with Lloyd George. I would say it began with the Clement Attlee government of 1945. There has been some things put in place by Lloyd George, but the Welfare State as we know began with the establishment of free healthcare, support for the most vulnerable. This was brought in at a time of full employment, but sadly successive governments have allowed this system to be eroded – and that’s another significant element. The Welfare State also exists in housing, that’s another aspect that came in my Nye Bevan. This also includes social care: organisations in community supporing old and disabled people. The whole idea of being looked after from the cradle to the grave, that came in with Attlee, and that’s what the Tories have been dismantling for years. DM – And do you that Attlee and Bevan would be proud of what has been achieved? KL – I think that Clement Attlee would have been dismayed, and Nye Bevan would have been incandescent with rage. I think Nye Bevan would be alongside Corbyn. Attlee was more defined by his time, while Bevan had underlined social principles in his heart, which would have aligned him with Corbyn. 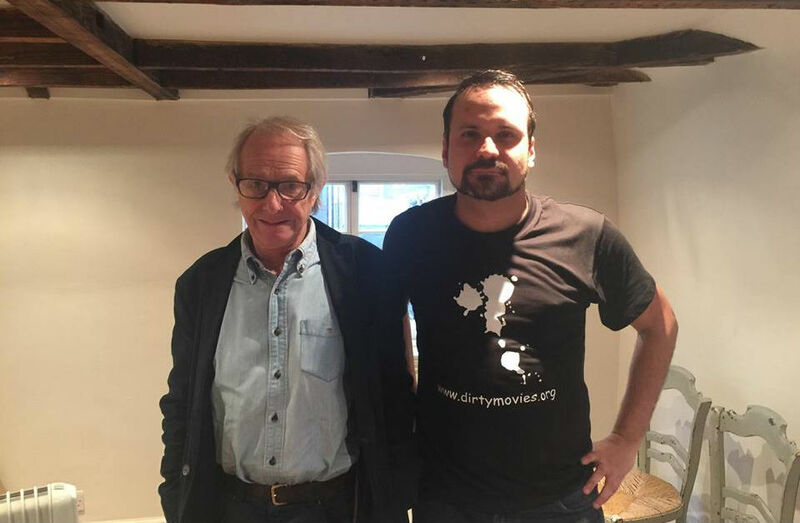 Ken Loach and Victor Fraga at the offices of Sixteen Films. If Cathy was alive, she’d be in a room half this size. DM – It’s 50 years since you made Cathy Come Home. So let’s move the years back. If Daniel Blake was born 50 years earlier and was unable to work, at the time of Cathy, do you think that he would have survived? KL – I think that’s a really good question. I think Daniel certainly would have survived because he would have received his sickness pay. He would have not been humiliated and tested time after time. There would have been no cruel regime to get him out of the office as quickly as possible. Not only would he have survived, but the health service would have been better set up to look after him. There weren’t cutbacks in beds, in nursing care. Everything was owned and controlled by us all. It was a proper National Health Service. Daniel wouldn’t have been forced into another heart attack back then. DM – Let’s turn things around. Had Cathy been born 50 years later, would she be homeless right now? KL – She probably would be homeless if she lived in London because the housing crisis is much worse now than it was 50 years ago. The arrangements for homeless people are different now. She would probably be in a hostel in room half the size of this room [an average double size room, pictured above] with three kids, including her baby, feeding, eating, sleeping and doing school work, all in one place. So maybe she wouldn’t be homeless, but that’s where she would be. DM – The French filmmaker Truffaut once famously said that the words “British” and “cinema” were an oxymoron. Yet, it was a French Festival, Cannes, that gave you possibly the most important accolade of your career, and twice: the Palme d’Or. On the other hand, American awards such as the Oscars haven’t recognised your work as emphatically, despite the enormous cultural affinity between the US and the UK. Why do you think that is? KL – I hope Truffaut was joking. I think the French take cinema more seriously. They don’t see it as a commodity, as a product to make money, like Americans do. They have a wider view of cinema. Of course I was delighted to receive this accolade from the French. Well, the jury isn’t exclusively French, it’s international, but the French audiences have been incredibly generous to us. They have always screened our films to a very wide public. They are very conscious of our depth. It would be nice to meet with François Truffaut, share a glass and change his mind! DM – You recently said that BBC period dramas sell fake nostalgia. Parallel to that, Jeremy Corbyn said that our children should be taught about suffering under the British Empire in school. Do you think that the British media and the education system convey a distorted sense of Britishness, neglectful of our shortcomings? KL – It’s a fake patriotism. There’s always exceptions, but by and large the traditional Sunday night television period dramas are nostalgic, like a Christmas card. People walking through snow and not getting damp. That’s ok, as long as we know what it is, but you need the corrective of films and stories that tell the truth rather than a kitsch nostalgia. Gordon Brown once said that we need to stop apologising about the British Empire, but I don’t recall there ever being an apology. The British Empire was founded on land conquests, enslaving people, transporting them to other countries, stealing people’s natural resources, exploitation, brutality, concentration camps. We do need to tell the truth about that. I’m not saying we should wallow in guilt. This is what happened and we need to know our history, that’s all. The fake patriotism of Britannia rules the waves is nonsense. DM – Can you mention a few names in film or television of people who do a good job in portraying an authentic Britain? KL – I prefer not to name people because I don’t want to miss anyone out, and also because my memory is rubbish. I think there’s a lot of hugely talented young people who could do it. 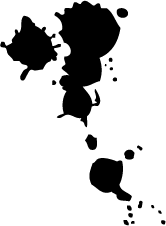 There are also brilliant writers out there, and they need producers who can work with them, and of course we need the television channels to commission the right work. And not be cowered by management, or be micromanaged. No one should be chipping in and telling them what to do. DM – Let’s talk about post-Brexit Britain. Do you think being British now means the same as before the referendum? KL – The debate over Europe was complicated. On the left, a lot of people opposed the EU as an economic project because it’s a neo-liberal project favouring business. It doesn’t mean that they refuse to work with the EU corporation. They might want to stay or to leave for tactical reasons. The position of the right is that they had a romantic idea of British sovereignty and English, of us as a separate nation. This is very strong in both English and British consciousness. Britannia Rules the Waves is part of this nostalgia. A lot of people on both sides felt alienated and neglected, like no one spoke to them. So they voted against the establishment, against what Westminster was telling them. The Leave vote was a complicated mixture of all that. This [conjecture] has raised up old memories of dislike of immigrants. It’s very disturbing. We need very strong political leadership from the left in order to change this, in the interest of ordinary people. DM – Will you be dealing with the subject of immigration and xenophobia anytime soon? KL – I don’t know yet. I’ll have to wait and see first what the future brings! 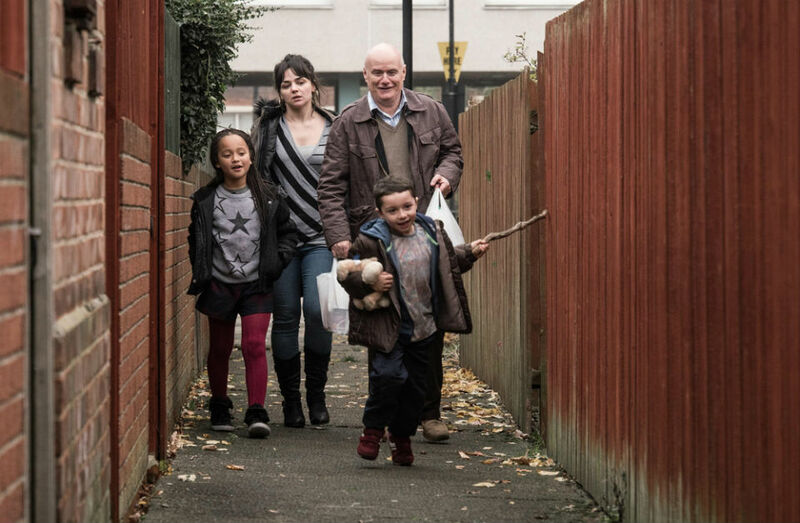 Click here to read our review of I, Daniel Blake (2016). Or here for our review of Poor Cow (the 1967 classic was rereleased earlier this year). And here for our review of his biopic Versus – the Life and Films of Ken Loach (Louise Osmond, 2016).